Residents of a Great Harwood care home are enjoying seaside trips down memory lane now that their lounge has been decorated with Blackpool seafront mural wallpaper. The large-scale image of a sunny summer’s day in Blackpool occupies a full wall in a lounge at Townfield & Coach House in Church Street. As a specialist care home for people with dementia, Townfield & Coach House owners, brothers John and Michael Timmins, are abreast of latest research into helping dementia sufferers live well with their condition. John Timmins said: “We are always improving the living environment at our care homes. 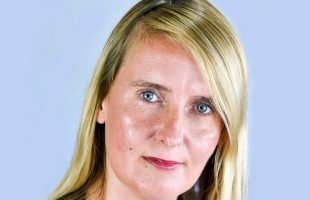 Our plan is to take guidance from the research of University of Stirling to design the home in a more dementia friendly way. By using colour-coded décor and furnishings, we can help our residents to distinguish between different areas and to feel at home in spaces they use regularly. “We spotted a tweet from Scott Dawson Advertising in Burnley about full scale image wallpaper they’d produced for their very own Jesse McClure room at their Burnley HQ. I thought they could help us to create a completely different feel within our upstairs lounge so gave Murray a call. 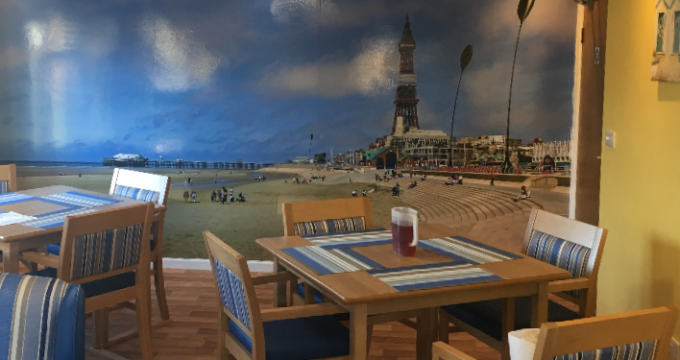 “We chose a Blackpool seafront image for our wallpaper as many of our residents are of the generation that visited the seaside resort on their annual holidays. Scott Dawson Advertising, a full-service marketing agency based in Burnley, designed, printed and installed the Blackpool seafront wallpaper earlier this month.